Photographer: Signe Vilstrup. Model(s): Aia Busk. Source: Dansk Magazine. Stylist: Kimmie Therese. Makeup: Anne Staunsager. Aia Busk straddles two worlds in ‘The Chromatic’ captured by Signe Vilstrup for Dansk Magazine, Spring/Summer 2015. The passion of the palate transformed into the art of the page, each image celebrates the spirit of change. Dare to dream in this evocative amalgamation of life reflected. Stylist, Kimmie Therese, uses flesh toned undergarments to embrace the age of enlightenment. A fusion of the phenomenal, this takes us to a place beyond the imagination. 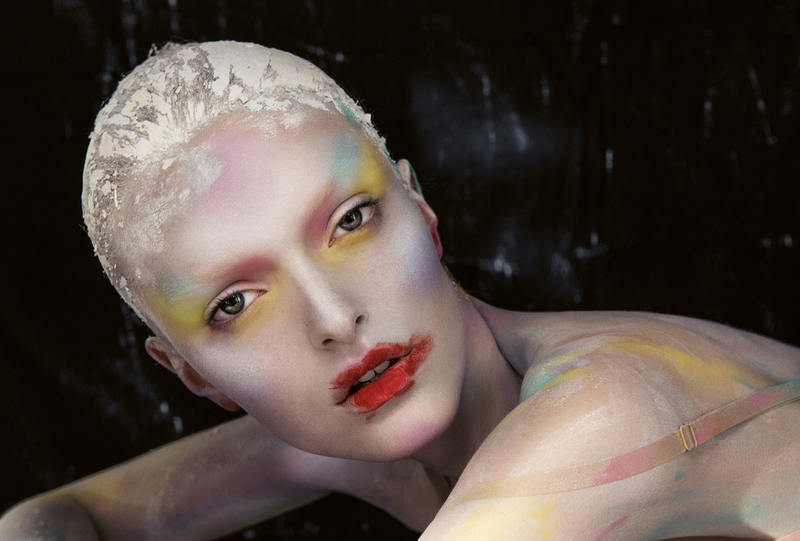 A mastery of modern makeup, Anne Staunsager captures colorful creatives with patterns you pickup with reckless abandon. The beauty of the body compels in this artful array of free expression. A thin, black pen outlines the face, as Staunsager emphasizes woman’s struggle to be heard. Ink infiltrates the skin letting unique designs reveal our right to be overtaken. Exposing the outer world to our inner vision, pastel secrets speak, in this overt take on the topic of female empowerment.